Those who genuinely sing for the Lord Jesus Christ do NOT emulate the sinful world in their music. Hip Hop is of the Devil. This is the apostate music of these Last Days in which we are living. Truly, the Lord's return must be very near, for the wickedness of the world is increasing exponentially before our very eyes each and every day. Woe unto the world! Christ-honoring believers do not hide their candle under a bushel for the Lord. TobyMac's concerts feature blaring loud noise, screeching guitars, flashing strobe lights, billowing smoke and screaming fans praising Toby instead of the Lord (John 12:43). There is no true Gospel preached, only a vague social gospel of synthetic love, unity and diversity. In an interview Tobymac was asked, “If you could say one thing to this generation, what would you say?” Here is Tobymac's lame reply . . .
We have different parts of the music body of Christ. We have bands that are out there in the trenches of the mainstream playing clubs every night. I’ve had moments in the mainstream and I’ve had moments where I was just in the gates of Christendom, not that there should be walls up, but . . . if I was talking to the Church the message I would have for them, people who have culture throwing everything at you . . . it’s very difficult to remain unjaded, to remain soft clay in God’s hands. For an artist like me who’s just put out my 8th cd (not counting remixes and greatest hits and all that stuff) my number one goal in my life is to remain unjaded. And I think that’s a problem in artistry. I think our artists backstage get jaded. The next song becomes the next song they gotta write because it’s their job. The next cd becomes the next cd they gotta go make in the studio because it’s their job. They fell like they’ve gotta do this for radio and do this for this department. It breaks my heart. Because if you can put yourself in that place every record, ever song, every studio session, every show where you’re just like, “I wanna walk on water today with this song I’m gonna write. I’m gonna step out in faith and believe with all my heart that God can breathe something through me that changes someone’s life. I’m gonna believe that God’s can breathe something through me that wakes someone up who’s turned away from His love and opens their mind to His love again. If you can do that, man, and remain soft clay life can be amazing. It really can. That was my goal with Portable Sounds. I was like, I will not walk into that studio hardened. That goes to everyone. Be soft every day. Walk on water. Have the faith to say, “Alright, God, I’m believing you’re gonna do something cool here.” And start steppin’. That's it? That's the most important message Tobymac has for this generation? This is so tragic and clear evidence that Tobymac is not a Biblical Christian. Tobymac speaks of being “soft every day” and of having faith to believe God will “do something cool,” but he does not elaborate nor mention the name of Jesus, nor does he mention the reality of sin. Jesus told Nicodemus in John 3:1-7 that a man must be born again to enter into the kingdom of God. If a person is not saved, they will go to Hell forever. The Bible teaches that Hell is a literal place of torment that burns with fire and brimstone, and lasts forever and ever (2nd Thessalonians 1:8-9; Revelation 20:11-15). If I could say one thing to this generation, I would tell them to get born again by the Spirit of God. Jesus came into the world to save sinners. All humanity has sinned and is therefore condemned to Hell by the Law of God (Romans 3:19). But God sent His only begotten Son into the world to pay our sin debt, because He loves us (John 3:16). Jesus died, was buried and rose again 3 days later (1st Corinthians 15:1-4). Jesus paid a debt He did not owe, because we owed a debt we could not pay. Just as a man is born physically into the world, so also does God require that a man be born of the Spirit of God to get into Heaven. This happens only by faith in Jesus Christ, the Son of God, to forgive one's sins. No works of self-righteous may be added, lest the Gospel be corrupted. We are saved solely by Christ's righteousness, which is by faith alone in Jesus (Romans 4:5; 2nd Corinthians 5:21; Romans 10:3-4). That is the most important message people need to hear. Tobymac, as with other ecumenicals, employs religious lingo in his statements and lyrics; but he never solidly presents the Biblical Gospel as I just did. Ye must be born again! Tobymac seems to be a believer in diversity more than anything else, for he continually mentions it. But diversity is just an excuse for unbiblical and sinful compromise. 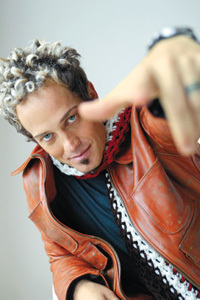 Tobymac praised the Pope in a May 2008 interview . . .
That kind of diversity is of the Devil, because the Pope is of the Devil. The Catholic religion is a demonic religious cult, who worship statues of saints, idolize Mary and dishonor the Lord by chanting 53 Hail Marys in every Rosary. Catholics believe that keeping the 7 sacraments will save them, but it won't. Water baptism cannot save a person. In fact, it will send you to Hell if you trust in it at all. Religion is a road to Hell. Jesus is the way, the truth and the life (John 14:6). The way of salvation is through the Son of God, Jesus, the Christ. Adding works to faith is no faith at all. The Pope is on his way to Hell in Catholicism's manmade traditions and unbelief. Tobymac shouldn't be supporting a false cult. Catholics teach that Mary was born without a sin-nature (Mary's Immaculate Conception), and that Mary remained a virgin (Mary's Perpetual Virginity) and that Mary was bodily caught up from the earth and never saw death (The Bodily Assumption of Mary). All 3 of these false doctrines are manmade and nowhere taught in the Scriptures. Yet, they form the foundation of the entire Catholic religion. I've had some blinded Tobymac fans write to me over the years, claiming that Tobymac is a man of God. What a joke! What a big pathetic joke! Man of God? No way! Here's a TobyMac video evidencing just how worldly his concerts are. This is no man of God . . .
Do you really foolishly think this is a man of God? Tobymac is serving Satan by pulling on the same rope as the Devil. He is subtle. A man of God would not lead millions of young people to unite with false religions, receive unworthy praise from the fans and charge them money. I'm sick and tired of all these CCM singers making tens-of-millions of dollars selling repackaged Rock 'N' Roll in Jesus' name, claiming it is the work of God. No, it is the work of the Devil. The love of money is the root of all evil, including Christian Rock. Not only does Tobymac endorse the biggest false prophet in the world; but he also fails to present the Gospel to his millions of fans. It is tragic. Jesus said in Luke 8:15 that they who have a good and honest heart will keep the word and bring forth much fruit. This speaks of the soul-winning Christian. Tobymac talks a good talk, giving the impression that he cares about his fans and wants to reach them for God; but encouraging people to live a better life in Jesus' name is nothing more than an empty religious message. The Biblical Gospel is that a man absolutely MUST BE BORN AGAIN! Like all mainstream Contemporary Christian Music [CCM] singers, Tobymac is extremely vague, wishy-washy and doesn't clarify what he means by “faith.” He keeps speaking of his belief in diversity. Muslims have faith in God, but they deny Jesus as the Christ. Tobymac speaks of diversity, which embraces all faiths, even false religions. This is the lie of the New World Order, i.e., all faiths are acceptable, it doesn't matter what you believe, just have faith. But the Bible is intolerant of all religions. No religion can save a soul from it's wickedness. Salvation is found only in the name of Jesus (Acts 4:10-12). If Tobymac believed that, then he wouldn't publicly praise the Pope. I tell you, the Pope is the vicar of Hell, a sinister minister and the enemy of God. There are thousands of CCM artists, who have made it big in the music business; but they have all forgotten the God of the Bible. They use just enough religious vocabulary to deceive their fans, but no one ever hears a powerful Gospel message. All the fans hear about is love, diversity and faith in God; but that's what every demonic cult believes too! Judaizers all have faith in God, but they reject the Son of God; thus, the Bible labels them as LIARS and ANTICHRISTS (1st John 2:22-23)! The Bible does not mention diversity. God tells us to separate from the ungodly (2nd Corinthians 6:14-17). Although the Bible does speak of different parts of the Body of Christ, CCM apostates corrupt these Scriptures to justify yoking together with the unsaved in false religions such as Roman Catholicism. Catholics are NOT a part of the Body of Christ! They are not saved. They have not been born-again by the Spirit of Christ (Romans 8:9). Sacramental salvation is a doctrine of devils. Baptismal Regeneration is a doctrine of devils. Salvation is of the Lord, by faith alone (Ephesians 2:8,9). Most churchgoers have never been born-again and are still hellbound in unbelief. Thankfully, the blood of Jesus Christ takes our sins away (1st Peter 1:18-19) if we'll simply acknowledge our guilty condition (Romans 3:19) and believe on Jesus as the Christ, the Son of God (John 3:16). Don't be deceived by the Hip Hop ungodliness of this apostate generation. The Bible speaks of making melody in our hearts to the Lord. Hip Hop came from the crime-infested ghettos, which is where it belongs, not in the churches. Satan has infiltrated the world's churches with all types of falsehoods and worldliness to deceive the masses. The Bible tells us that all such apostate churches will follow the Antichrist when he comes, under the leadership of the False Prophet! We are living in the Last Days. The end of the world as we know it is nearer than ever. The New World Order is upon us and soon to be completed. Satan knows that he must unite all the world's religions into ONE, so that they will obey the Antichrist. This is why Tobymac speaks so much about DIVERSITY, LOVE and UNITY. Ironically, it all done under the pretense of love. But it is no love. God's unconditional love causes a person to speak THE TRUTH, even at the risk of making enemies. So-called Christian Rock is akin to Judas betraying the Son of God with a kiss. Satan is the god of this world. Multitudes of CCM albums are saturated with occult and New Age symbolism. This all shows allegiance to the New World Order and ultimately, Satan. Even at CCM concerts, the El Diablo hand sign (which signifies devotion to Lucifer) is flashed repeatedly and shamelessly. I tell you Biblically, as a born-again believer who loves Jesus Christ, there is no such animal as Christian Hip Hop or Funk. Anyone who refers to them self as a “Jesus freak” is dishonoring the Lord. Tobymac is a featured singer at Christianpunks.com, which is a shameful website. There is no such thing as a “Christian punk.” I feel sorry for the millions of young people who think it is acceptable by God to be a punk. Why not call themselves Christian thugs? Or how about Christian pimps? It is just irreverent toward the Lord. Why not be Christian men! Don't come around calling my precious Savior a funky freak, referring to yourselves as Christian punks, and teaching America's teenagers how to Hip Hop and flip flop. We need to leave the lid closed on the sewer, i.e., leave Hip Hop in the ghettos where it originated. Such disgraceful filth has no place in the New Testament Church.